Malynowskyj, Alexander [Олександер Малиновський] – priest of the Ukrainian Graeco-Catholic Church (UGCC), active in church and community affairs; born on 12 January 1888 in the village of Zhukiv (Zolochiv raion, Lviv oblast, Ukraine; at that time – Zolochiv county, Austrian crown land of Galicia); died on 18 November 1957 in Bradford, England, United Kingdom; buried in Gunnersbury Cemetery, London. Alexander Malynowskyj completed his secondary education in Peremyshl, after which he served for a year in the Austro-Hungarian army, and then, to 1912, studied law at the University of Lviv. During the First World War he served as a junior officer in the Austro-Hungarian army. In 1918-1920, during the Ukrainian Revolution of that time, he was a captain in the Ukrainian Galician Army. In 1921 he entered the Graeco-Catholic seminary in Lviv, and in 1925 was ordained a priest by Metropolitan Andrei Sheptytskyi. After a brief period of parish work in Zolochiv, in 1926-1932 he served as prefect of the Lviv seminary and in 1932-1939 was its vice-rector. In 1937 he became director of the “Khrystyianskyi internat” student hall of residence in Lviv. He was a member of the Lviv-based Theological Scholarly Society. In July 1939, at the request of Metropolitan Sheptytskyi, he left for the Lemko region. From the end of that year to August 1940 he headed the social services department of the Ukrainian Central Committee in Kraków. In August 1940 he became vicar general of the Rev. Yakiv Medvetskyi, the apostolic administrator of the UGCC in the Lemko region. In February 1941, after the death of the Rev. Medvetskyi, he succeeded him as apostolic administrator. In 1944 he was nominated as a member of the Ukrainian Supreme Liberation Council but wartime events prevented him from attending its founding assembly. In September 1945, with the assistance of members of the Ukrainian Insurgent Army, he crossed the Czechoslovak border and in December reached Bavaria, Germany. In July 1946 he was appointed rector for education and administration of the newly-founded Ukrainian Graeco-Catholic seminary located, initially, at Hirschberg Castle in Bavaria, then, from 1948, in Culemborg, The Netherlands. At the end of 1950 the Rev. Malynowskyj was appointed by the apostolic visitor for Ukrainian Graeco-Catholics in Western Europe, Bishop Ivan Buchko, as his vicar general for Great Britain and Ireland (see Ukrainian Catholic Church (UCC) in Great Britain). He took up the position in January 1951 and also became the parish priest of the London parish of the UCC. In 1954 he was granted the title of Domestic Prelate (equivalent of the current title Honorary Prelate) of Pope Pius XII. 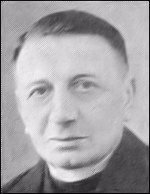 With the appointment in June 1957 of Archbishop William Godfrey as the first apostolic exarch for Ukrainian Catholics in England and Wales, the Rev. Malynowskyj became his vicar general. He was a member and spiritual mentor of the Obnova Ukrainian Catholic Association. He was also a member of the Relief Board for Ukrainian Students in Great Britain and head of its financial oversight committee, and a member of the Association of Former Combatants in Great Britain. From December 1937 he was a member of the Shevchenko Scientific Society (NTSh) in Lviv and, from the late 1940s, of the NTSh which was revived after the war in Germany.